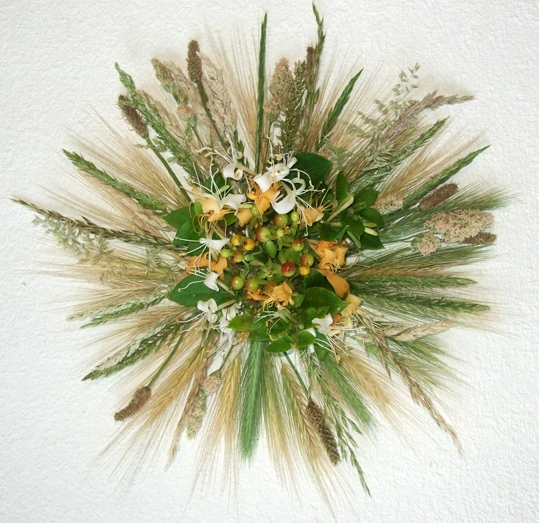 Here is my mandala for the month of June, celebrating the Summer Solstice with a sun wheel made from wild grasses and flowers from my garden. In the photo at the top I boosted the colour saturation with Photoshop to bring out the vibrant yellows and greens and make it look more sun-like. The picture at the bottom shows the natural colours. 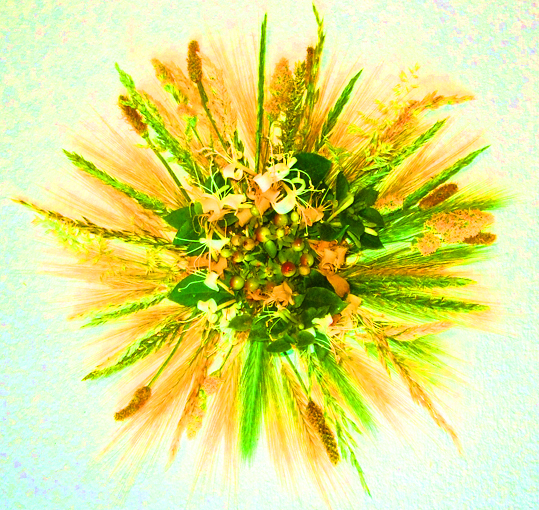 I wanted to make the sun mainly from grasses partly because June is when the grass pollen gives me trouble with hayfever. I've struggled through many summer solstice rituals out in the countryside while suffering with sneezing, watering eyes and itching skin. But grasses are also a vital part of the natural world, and I wanted to celebrate their beauty and variety too. In the centre of the mandala are honeysuckle and tutsun. According to folklore, if honeysuckle grows near your home it will attract money, love and good luck. Its sweet scent is also supposed to help clear the mind and promote psychic powers. Tutsun is a shrub that is a type of St John's wort - associated with midsummer and the feast of St John on 24 June. The yellow flowers quickly turn to berries, which you can see in the very centre of the mandala. One of my new year resolutions for 2017 was to create a mandala each month to show the changing seasons and including things from my own garden - and I've now kept that resolution for half of the year. You can see links to my earlier mandalas at the bottom of this post. I was inspired for my resolution after I created a mandala for the front cover of a Moon Books community book I edited - Every Day Magic: A Pagan Book of Days - which is due to be released this autumn. It offers ideas for things to do every day of the year to celebrate the changing seasons. You can view the book on Amazon.